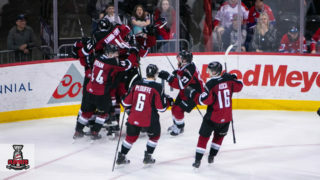 Leading the way among Western Hockey League clubs in the final set of rankings were the second place Moose Jaw Warriors, who have already had a record-breaking season and will be looking for more success in the 2018 WHL Playoffs. 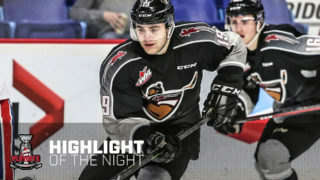 After capturing their first Scotty Munro Memorial Trophy in team history, overage forward Jayden Halbgewachs (San Jose Sharks) won the Bob Clarke Trophy as the WHL’s top scorer and was selected as the 2017-18 Eastern Conference Player of the Year, putting him up for the Four Broncos Memorial Trophy as the WHL Player of the Year. While the regular season accolades are no doubt appreciated, the team’s focus has always been on hoisting the Ed Chynoweth Cup, bring the trophy back to Moose Jaw for the first time in franchise history. 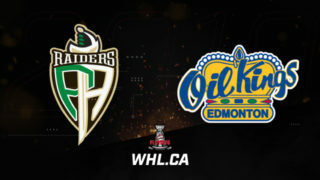 They’ll begin the 2018 WHL Playoffs against the Prince Albert Raiders Friday, March 23 (7:00 p.m. MT) at Mosaic Place. 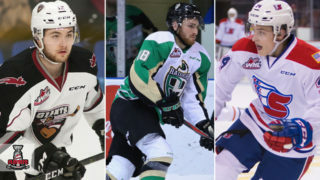 Though they were ultimately unable to fulfill their aspirations of overtaking the Warriors in the standings, the Swift Current Broncos remained hot on their heels in fourth place in the CHL Top 10 Rankings. Broncos captain Glenn Gawdin (Calgary Flames) made his final regular season of junior hockey one to remember, finishing second in WHL scoring with 125 points (56G-69A) in 67 games. He was deservedly recognized as a member of the Eastern Conference’s First All-Star Team. His teammate, Aleksi Heponiemi (Florida Panthers) was also named to that First All-Star team and was chosen as the 2017-18 Eastern Conference Most Sportsmanlike Player. The Broncos will being their pursuit of the franchise’s fourth Ed Chynoweth Cup starting Friday, March 23 (7:00 p.m.) at Innovation Credit Union i-Plex against the 2018 Mastercard Memorial Cup host Regina Pats. Rising to seventh in this week’s final rankings were the U.S. Division Champion Everett Silvertips, who put the finishing touches on their 2017-18 campaign with a pair of strong wins over the Victoria Royals. 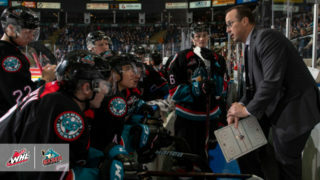 The team’s impressive campaign saw them recognized for multiple Western Conference awards, including Coach of the Year, Executive of the Year, Goaltender of the Year, and Player of the Year. As the top-seeded team in the Western Conference, the Silvertips will being their run in the 2018 WHL Playoffs against the Seattle Thunderbirds for the fourth meeting in five seasons between the two clubs. That series gets underway Friday, March 23 (7:35 p.m. PT) at the Angel of the Winds Arena. Another honourable mention for the Portland Winterhawks rounded out the final CHL Top 10 Rankings of the season. Cody Glass (Vegas Golden Knights) closed out his 2017-18 regular season by surpassing the 100-point milestone with 102 points (37G-65A) in 64 games. He was also selected as the 2017-18 Western Conference Most Sportsmanlike Player. The Winterhawks will now try to carry the momentum of a strong season into the WHL Playoffs as they look to win their first WHL Championship since the 2012-13 WHL season. 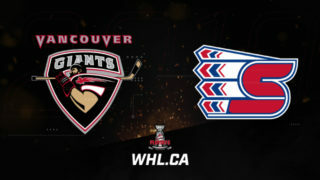 To do that, they’ll need to play a strong game against the Spokane Chiefs, with the series getting underway Saturday, March 24 (6:00 p.m. PT) at the Veterans Memorial Coliseum.